I recently attended the Dealer Synergy Internet Sales 20 Group conference in Boston. I left with that unique feeling that comes after you have opened yourself up to really learning, and have attained clarity with clear direction. The event was attended by the majority of Toyota dealers in the New England / Boston Region (as well as some folks from the Toyota corporate office), several Massachusetts State Automobile Dealers Association dealers, and of course the Dealer Synergy consulting team and their partner vendors (we at CarsDirect are proud to be such a partner). We all know that many auto conferences tend to be light on content. The Internet Sales 20 Group workshops are different, offering an intense three days of real working groups tackling the digital space with a passion for improving and advancing the industry. I was part of a panel that discussed CRMs and digital media / advertising consisting of a group that represented a phenomenal amount of industry experience. I also led a session on Mobile Strategy that was met with great interest, and Mobile continued to be a strong theme over the course of the conference. Indeed, the passion and energy from the dealers who attended was palpable – and no one was afraid to speak his mind and address the tough subjects. If you really want to learn, and have a passion for improving your Internet / Digital Sales department, I highly recommend you consider an upcoming Internet Sales 20 Group conference. Internet leads are a part of daily life for today’s dealers, but many still struggle with simply getting a hold of the customer. Sometimes, going back to basics helps identify why conversion rates aren’t higher. Calling customers at the wrong time – Sales reps can focus too much on getting through every lead every day and forget that if they consistently can’t get a hold of someone at 10am every day, for example, that they should try the prospect at a different time. It’s important to focus on prime contact hours – look at mornings before work, lunch, evenings after work, and weekends. Method of contact – Many sales reps don’t try to text the customer. Or they reach out only via e-mail, and if calling leave bland messages that don’t elicit a return call. They don’t examine their customers’ behavior to understand what the best opportunity is for contact. At CarsDirect, we’ve sold hundreds of thousands of vehicles through our brokering business without ever seeing a customer face-to-face. When optimizing your lead conversion processes, consider the above points, and remember: Dealers need to step into the customer’s buying process, not force the customer to their selling process. CarsDirect’s parent company, Internet Brands, recently announced that it has acquired High Gear Media, a next-generation publisher of automotive news, information, and tools for in-market car buyers. High Gear Media joins the Internet Brands Automotive Group, which includes CarsDirect and our collection of more than 130 auto enthusiast websites. Founded in 2007, High Gear Media has grown to operate some of the fastest-growing online automotive brands, including The Car Connection (research content and e-commerce) , Motor Authority (luxury and performance news and enthusiasts), and Green Car Reports (clean environmental news and enthusiasts). The combined Internet Brands Automotive Group / High Gear Media audience will number more than 35 million unique monthly visitors, making it one of the largest automotive networks on the Internet. As a dealer, you’ll benefit from even more organic new and used car sales opportunities. Robust advertising options including display ads and new / used car leads will allow you to precisely target your desired market segments. To find out how you can start benefiting from this exciting addition to our portfolio, contact your CarsDirect representative or e-mail us today! Fiat is betting big that its once-dormant Maserati brand will grow to sell 50,000 cars annually. A big part of those hopes rests on the company’s new more compact – and more affordable – luxury sport sedan, the Ghibli. Priced from $66,900, the Ghibli is poised to strike in a competitive North American market. The Ghibli is intended to compete with high-trim performance versions of longtime stalwarts including the BMW 550i, Audi S6, Mercedes-Benz E550, and Cadillac CTS Vsport. Touting a Ferrari-built, twin-turbo V6 engine, an interior adorned with rich Italian leather and woods, and available Bowers & Wilkins 15-speaker audio system, Maserati hopes to lure buyers from the more traditional offerings in the segment with an exotic nameplate and a focus on performance. But is Maserati’s new entry connecting with these buyers? To find out, we used exclusive CarsDirect cross-shopping data from the past three months to take a look at the top five vehicles currently cross-shopped against the 2014 Maserati Ghibli. CarsDirect’s take: The top two vehicles cross-shopped against the Ghibli are higher-priced models from Maserati’s own stable, meaning that many buyers are considering the Ghibli as a low-cost option to get a Maserati into their garages. However, the Ghibli is also appealing to those interested in hot-selling high-end vehicles such as the Tesla Model S and Jaguar F-Type, indicating that the Ghibli is getting the attention of buyers interested in the latest-and-greatest high-end offerings. These buyers are more likely to know about the Ghibli than buyers of the more traditional competitors the Ghibli is targeting (such as the upper-trim versions of the BMW 5-series), which are missing from the list. Maserati is currently offering attractive lease rates on the Ghibli in many markets, and sales are up considerably as a result. As more Ghiblis hit the streets, we wouldn’t be surprised to see the Ghibli poach more of the traditional high-end midsize luxury sport sedan buyers the brand hopes to capture as awareness of the model grows. Want custom cross-shopping data for the vehicles you sell? Contact us at 866.852.3784 or connect@carsdirect.com for a customized cross-shop report. There’s no doubt that text messaging has permanently changed the way people communicate. For better or for worse, texting is here to stay. But can texting actually help you sell more cars? As we covered in previous Dealer Reports, one-third of mobile inquiries are either buying this weekend, on their way to a dealership right now, or actually at a dealership shopping. Savvy dealers have been texting with customers to set up appointments, answer questions, and negotiate deals for quite some time now. Here at CarsDirect, we saw an opportunity to take the power of texting and mobile devices a step further – to engage customers via text whether they’re seeing one of your ads at home, browsing your inventory while on the go, or actually on your lot. This month, we’re officially unveiling CarsDirect Mobile Connect, a cutting-edge, turnkey mobile marketing solution designed to maximize sales opportunities among mobile customers. These landing pages feature an automated vehicle inventory feed featuring VIN details, and photos. 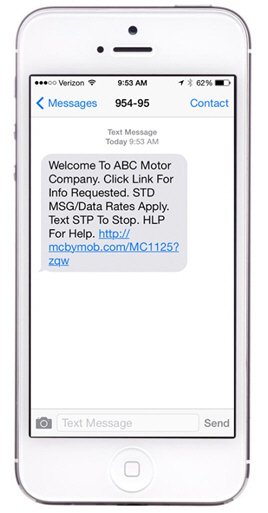 Customers can text your dealership for more information directly from the page. Landing pages also make use of clean, responsive design that renders correctly on virtually all mobile devices. No existing mobile site, or not happy with your current mobile site? No problem. 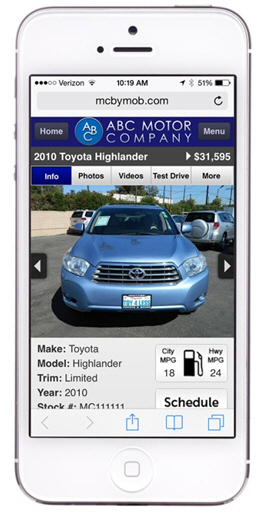 CarsDirect Mobile Connect can easily become your mobile site, and even use your existing domain. All of us at CarsDirect are very excited about the mobile capabilities that CarsDirect Mobile Connect is bringing to dealerships across the country. We plan continuous upgrades and enhancements to the products as the mobile customer continues to evolve. If you’d like more information about CarsDirect Mobile Connect or have specific questions about how this texting technology can help your dealership sell more cars, please get in touch at any time at connect@carsdirect.com or (800) 260-5857. It’s been an exciting time for us here at CarsDirect and at our parent company, Internet Brands (see the official announcement here). To think back on the days when we needed to sell 10 more cars on the last day of a month to secure our next round of funding, but if we didn’t… gulp! Well, we made it through those early days, and here we are almost 15 years later getting ready to close on a sale valued at over $1.1 billion. This wouldn’t have been possible without you, our dealer partners, and we thank you for your dedication and loyalty in helping us evolve to where we are today. Over the past decade, and especially in the past few years, we’ve turned our focus to the media side of car buying by producing top quality content for our consumers to fuel our phenomenal growth. Internet Brands has continuously invested in CarsDirect – and the entire Internet Brands Automotive Group – to ensure that we stay ahead of the innovation curve. As we look toward our bright future with KKR as a partner, we continue our laser focus on the mobile customer, and how they want to connect to dealers and get their information. As we’ve explored over the past few months (and continue to explore this month in our article about using text messaging as a marketing channel), the online consumer is showing us that they are changing, and we’re leading the way to give them what they want. Here’s to another 15 years of growth and innovation with the success of our dealer partners as a top priority! When Lincoln’s MKZ debuted in 2006, it impressed buyers with a luxurious interior that featured an array of standard equipment. What didn’t please anyone was its resemblance to the mass-market Ford Fusion. If not for its Lincoln grille and tail lights, the MKZ’s exterior styling made it a dead ringer for the Ford. That made it hard for the MKZ to compete with both entry luxury stalwarts like the Lexus ES350, and with more performance-luxury oriented competitors like the BMW 3-series and Cadillac CTS. A 2013 restyle of both the MKZ and Fusion brought greater differentiation. Although many components remain shared with the Fusion, the MKZ now looks and feels like a distinct automobile, especially with its optional sliding glass roof. Are these distinctions ringing with consumers, or does Lincoln continue to compete with itself and other vehicles in the Ford family stable? To find out, we used exclusive CarsDirect cross-shopping data from the past three months to take a look at the top five vehicles currently cross-shopped against the 2014 Lincoln MKZ. CarsDirect’s take: It’s perhaps no surprise that the primary model cross-shopped against the MKZ is the hybrid version, since it delivers 45 mpg—tops among all luxury cars—and costs exactly the same as the base non-hybrid V6. However, the next most cross-shopped model continues to be its Fusion cousin, followed by the mass-market Honda Accord. Offerings from Cadillac – Lincoln’s closest traditional rival – round out the top five. These findings indicate the Lincoln still has some work to do in terms of capturing attention from entry luxury shoppers considering the dominant German and Asian competition. A recent advertising campaign might help jump-start such consideration, and as the striking MKZ continues to hit the streets in larger numbers, we wouldn’t be surprised if this cross-shopping data changes significantly over the next year. Want custom cross-shopping data for your vehicles? Contact us at 866.852.3784 or connect@carsdirect.com for a customized cross-shop report. Earlier this month, I attended the Internet Sales 20 Group in Atlantic City, where I hosted a really interesting and engaging session. Sean Bradley and his team at Dealer Synergy have been putting these 20 Groups on for a decade now, and the combination of information with interactive work sessions are the best in the industry. There’s another Internet Sales 20 Group coming up in Boston in September. If you’ve ever thought about attending, I would highly recommend doing so due to the level of learning and highly relevant topics being addressed. At this past 20 Group, there was a lot of talk about the rapid consumer migration from desktop computers to mobile devices when it comes to researching and – more importantly – buying a car. I focused my session on these trends, and shared information from our CarsDirect customer surveys that ask consumers about their research habits and buying experience (see this month’s article for more information on this data). It’s very clear that eyes are wide open about the shift to mobile – we’re all aware it’s happening, but there is still much to learn and think through. One item that really stood out was when I asked attendees about how the mobile lead is handled at their dealership, and was there a different process in place to interact with mobile prospects. Only one dealer out of 200 attendees said that they have a customized process around handling the more urgent mobile consumer who is ready to buy right now. One! The data tells us that one-third of mobile inquiries are either buying this weekend, on their way to a dealership right now, or actually at a dealership shopping. So there is a clear need to identify which customers (leads, texts, inquiries, etc.) are coming from a mobile device so you can jump on them with more urgency. The auto consumer is increasingly texting rather than calling, and is certainly rapidly moving further away from filling out a full lead form on the web. Times have changed. We’ve been watching these changes in consumer behavior closely here at CarsDirect, and have been hard at work developing products that make it easier to identify and interact with mobile consumers. 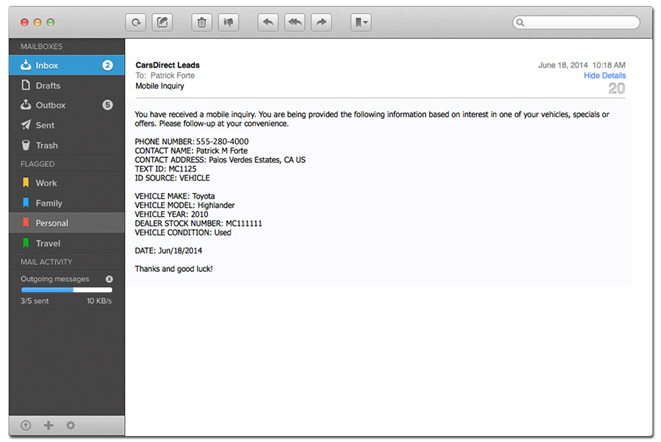 We can now connect you at the dealership with the consumer via text message, and pass the customer’s phone number and name as a lead directly into your CRM. 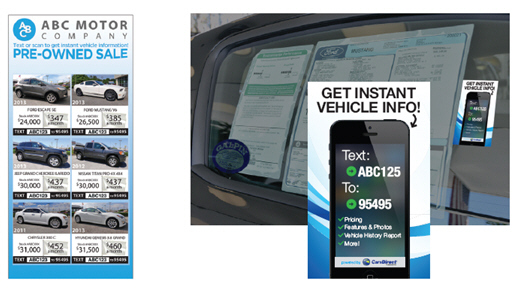 We’ve also innovated further to reach the customer in the instant they are shopping, using window decals that encourage customers to text a number for more information on the vehicle they are physically looking at. Additionally, we’re making sure that you’re connecting with consumers on their mobile device of choice by offering out-of-the-box mobile dealer sites that render correctly on all mobile devices. The results so far have been astounding, proving that these innovative new mobile-focused products can give you the advantage to sell more cars by interacting with more buyers right when they are ready to buy. Ask us about this newest suite of products, called Mobile Connect. We’ll show you how you can connect with and track the mobile customer, giving you unrivaled visibility into your advertising efficacy using our one-of-a-kind proprietary mobile text and mobile website tools. If you have any questions about these new products or the shift to mobile in general, please don’t hesitate to contact me directly. Hit It Big at Digital Dealer 16! Are you attending the upcoming Digital Dealer 16 conference in Atlantic City from May 6-8? So are we! Visit CarsDirect at booth #531 to meet some of our team members and learn more about our latest products, such as Mobile Connect. Also, be sure to enter our drawing to win a TaylorMade JetSpeed driver! The drawing will take place at the CarsDirect booth on the evening of Wednesday, May 7. The Kia Cadenza – a new model unveiled for the 2014 model year – gave Kia the large sedan its lineup lacked. Sharing a platform with corporate cousin Hyundai Azera, the Cadenza goes up against established large sedans such as the Chevrolet Impala, Toyota Avalon, and Dodge Charger. Kia is aiming high with the Cadenza, positioning it as a premium offering in the segment. As a result, it’s more expensive than many rivals, but offsets its price premium with an impressive list of standard features like wood trim, rain-sensing wipers, and a ventilated driver’s seat. Options are even more premium, including a snow-white leather interior. Is Kia’s upmarket strategy for the Cadenza connecting with potential buyers in the class, or is it cannibalizing sales of its own products? To find out, we used exclusive CarsDirect cross-shopping data from the past three months to take a look at the top five vehicles currently cross-shopped against the 2014 Kia Cadenza. CarsDirect’s take: While the Cadenza appears to be capturing the attention of shoppers looking for something more upscale than a Honda Accord, our cross-shop data indicates that the Cadenza is mostly getting attention from shoppers looking at vehicles from within the Kia line-up, or those looking at vehicles from Kia’s corporate cousin, Hyundai. While these shopping patterns are likely helping keep large sedan buyers “in the family,” therefore salvaging some sales, it doesn’t appear that the Cadenza has built the mindshare necessary to appeal to shoppers of the established players in the class – yet. As more Cadenzas roll onto the streets and if Kia ratchets up advertising for the Cadenza, we wouldn’t be surprised to see these patterns change in the future.